Abstract: Biotites from altered granitoid rocks on Pezinok-Kolarsky vrch Hill Sb-Au deposit belong to the phlogophiteannite series with the ratio Fetot/Fetot + Mg) = 0.44–0.55. Mg-biotites are the dominant type and can be classified as phlogopites (Phl30.09–45.79Ann26.67–36.00Eas22.93–10.22Sid20.31–8.02). Fe-biotites (annites, Phl34.79–41.13Ann39.20–46.39Eas12.22–5.86Sid13.79–6.62) are present in the more altered rocks. The chemical composition of the studied biotites is governed by Tschermak´s substitution, dioctahedral-trioctahedral substitution and A-1(Si+1Al-1)IV-substitution. Interlayer deficient occupancy of A site is probably caused by postmagmatic hydrothermal alteration and can be explained by A-1(Si+1Al-1)IV-substitution. The studied tri-trioctahedral chlorites come from the clinochlore-chamosite isomorphic series and they originated from biotites. According to the classification of Wiewióra & Weiss (1990) or Weiss (1991), they can be divided into two groups: ferrous clinochlores (schematic formula Mg34.39–36.32Fe28.31–37.07X24.02–35.39) and magnesium chamosites (schematic formula Mg34.33–37.90Fe34.76–39.32X23.18–28.30). Ferrous clinochlore is the dominant type of chlorite. The chemical composition of chlorites is governed by dominant FeMg-1-substitution and also by Tschermak´s substitution and dioctahedral substitution. The content of impurities (K, Ca, Na) is very low. White K-micas were formed mainly by alteration of alkali feldspars or plagioclases and can be divided into: phengitic muscovites and illites. Phengitic muscovites in the phengitic component (Brigatti et al. 2000) range from 0.17 to 0.25. The content of Ti is 0.016–0.020 a.p. 11 oxygens and indicates postmagmatic to hydrothermal origin (Miller et al. 1981). The content of interlayer occupancy (K + Ca + Na) ranges from 0.905 to 0.964 a.p. 11 oxygens and agrees with data from Konings et al. (1984), Piantone et al. (1994) and others. The chemical composition of phengitic muscovites is governed by Tschermak´s substitution, dioctahedral-trioctahedral substitution and A-1(Si+1Al-1)IV-substitution. The phengitic component for illites is 0.02–0.14. The content of Ti (0.005–0.019 a.p. 11 oxygens) indicates hydrothermal origin (Miller et al. 1981). The content of K ranges from 0.770 to 0.926 a.p. 11 oxygens and agrees with data from Cathelineau & Izquierdo (1988), Aja et al. (1991a,b), Srodon & Erbel (1984) and others. The chemical composition of illites is governed by substitutions A-1(Si+1Al-1)IV-substitution, dioctahedral-trioctahedral substitution and Tschermak´s substitution. 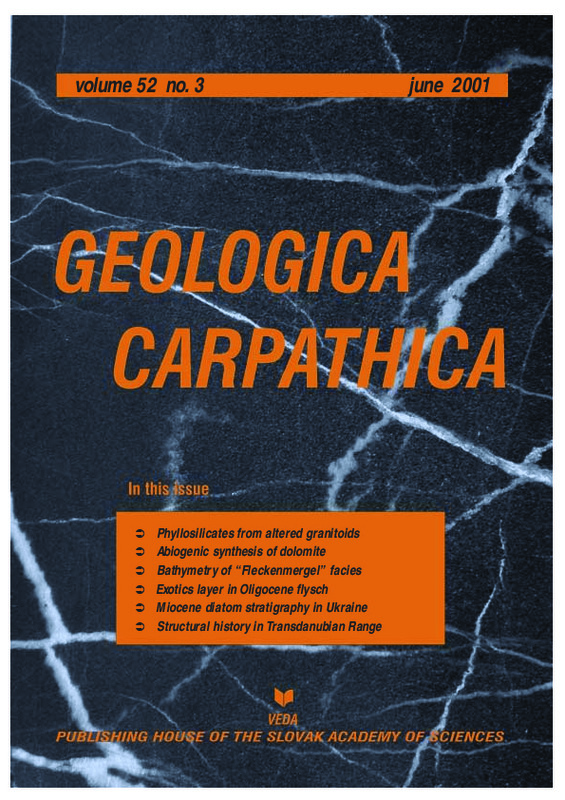 Abstract: Endowed with the theoretical knowledge of carbonate evaporation and the precipitation of CaMg carbonates from aqueous solutions the authors systematically researched the low temperature formation of dolomite-like carbonates. The results obtained at 40 °C indicate that the formation of rhombohedral CaMg carbonates depends on the solid matter/water ratio (solidus index Is). The higher the ratio, the more MgCO3 enters into the carbonate structure. The results also confirm a gradual transition of these relationships from calcite, through Mg-calcite, Ca-dolomite and Q-dolomite (Quasi-dolomite) to Mg-dolomite (Ca44Mg56). The structure of these synthesised carbonates is disordered, much like their natural counterparts in lagoons, sabkhas, soils etc. When studying Ca-dolomite in the laboratory it was found to restructure into stable dolomite at 100 °C and into calcite at 180 °C. Synthetized dolomite (Ca50Mg50) does not show superstructural X-ray reflections and hence it was denominated as a Quasi-dolomite (Q–D). Abstract: A layer with exotic blocks has been found in the flysch of the Krosno Beds, in the Fore-Dukla Zone (the southernmost part of the Silesian Nappe in the Bieszczady Mts, Polish Outer Carpathians). It has been traced over a distance of 1 km near Wetlina (the Bieszczady Mts), in the southernmost exposed tectonic slice. The exotic blocks include crystalline schist (quartz-chlorite-muscovite-orthoclase schist with tourmaline and garnet) and three types of limestones: 1/ massive, sparitic, partly siliceous limestone, with numerous calcite veins; 2/ micritic limestone with rare planktic (Globigerina-like) foraminiferal tests; 3/ bioclastic limestone with numerous tests of small and large foraminifers, coralline algae (Rhodophyta), bivalves, bryozoans and rare echinoid spines. The exotics are embedded in light- and dark-grey argillaceous, partly sandy, calcareous matrix, together with a few small angular pebbles of grey mudstones and very fine-grained sandstones, which resemble lithological types of the Krosno Beds. The described rocks are similar to those found as exotic blocks in the Krosno Beds in neighbouring areas (Roztoki Dolne and Ustrzyki Górne) of the Central Carpathian Depression (Silesian Nappe). Calcareous nannoplankton from the exotic-bearing layer and neighbouring deposits show that they are not older than the NP24 Zone (late Kiscellian), below the isochronous marker horizon of the Jaslo Limestone. It may correspond to the Tenuitella munda Zone of Olszewska (1997, 1998), proposed for the Polish part of the Central Paratethys. The source area of the layer with exotics (islands with narrow shelf mafgins), probably lay to the south and south-east, was built mainly of crystalline rocks, and partly covered by various types of carbonate Eocene-Oligocene rocks. The deeper parts of the island slopes were covered with Cretaceous-Paleogene sediments, related to deep-water sedimentation in the marginal zone between the Dukla and Silesian subbasins. These deep-water deposits have been partly eroded during the submarine mass movements descending to the Silesian Subbasin. Abstract: The diatom flora from the Miocene deposits of Ukraine was studied. Diatom zonation for the Early Miocene to Late Miocene is proposed. The first and last occurrences of diatoms, mass development of taxa, and level of reconstruction of the diatom association have been useful. The following diatom zones and beds with diatoms are defined: Craspedodiscus elegans–Cavitatus jouseanus in deposits of Batisiphonova Formation; Delphineis subtilissima in Korolevsky Beds; Lancineis parilis in the upper part of Balichska Formation, Actinocyclus ingens in Kartvel Beds and in the deposits of Tereblianska Formation; Anaulus mediterraneus in Kosovska Formation; Navicula pinnata in Buglovski and in Baskhevska deposits; Mastogloia szonthaghii-Cymatosira biharensis, Achnanthes baldjikii var. podolica and Navicula zichii in Sarmatian deposits; Thalassiosira delicatissima, Lyrella pigmea, Amphitetras sp., Actinoptychus senarius var. tamanica, Cymatosira savtchenkoi and Rhizosolenia bezrukovii in Meotian deposits; Stephanodiscus proprius-Stephanodiscus multifarius in Pontian. The stratigraphic position of the diatom zones and correlation with calcareous nannofossil zoene are considered. Abstract: The authors made geological mapping and microtectonic measurements in the Northern Bakony Mts., around the Porva Basin. Using structural observations, a new structural-geological map was made for this area. Four tectonic phases were separated by the analysis of stress field. Map-scale neptunian dikes represent the Jurassic rifting episode. For this phase NNE-SSW tension was estimated. NW-SE compression of Albian (?) age resulted in gently dipping reverse and conjugate strike-slip faults. In the Ottnangian-Sarmatian (18.5–11 Ma) a strike-slip type stress field with NNW-SSE compression developed. This phase formed mainly NW-SE striking dextral and conjugate shorter sinistral strike-slip faults. NW-SE striking half-grabens formed along strike-slip or oblique-slip faults. Motion resulted in post-sedimentary tilting of the Eocene-Oligocene sequences toward the master faults. A late Miocene extensional phase with WNW-ESE tensional directions was also determined. During this phase the earlier half-grabens were reactivated, although with slightly different slip on boundary faults. Some of the young half-grabens are connected by transfer faults, which had a strike-slip character. Ottnangian-Sarmatian strike-slip faults occurred during the rifting phase of the Pannonian Basin, their main activity was coeval with important stretching in the northeastern Pannonian Basin. These relatively local strike-slip faults could accommodate differential extension between the northern and southern Pannonian Basin. On the other hand, the newly recognized Late Miocene tensional phase indicate, that the post-rift evolution of the Pannonian Basin was associated with considerable crustal extension.